I rarely read director’s notes. Directors rarely say anything interesting in them and generally all they do is convince me of their inability to write thoughtfully about a play. Most people in the local theater consider the word “intellectual” something to avoid; the way most theater people spit forth program notes simply confirm the fact. 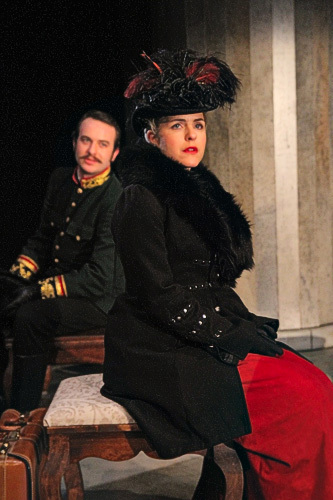 So I did not read the director’s notes or anything else in the program until I left the Seattle Center Armory after Book-It Repertory Theatre’s Anna Karenina. I just sat and watched. What I saw onstage was a predictably bright and talented cast and a fine adaptation, yet I felt a deep sensation of emptiness about the production. Upon reading the program notes once I returned home, the origin of that emptiness became obvious. For the most part, the actors are excellent. They manage as an ensemble to give the play an emotional rhythm, by turns humorous and tragic, without ever losing the seriousness of the story. David Anthony Lewis is exceptional as Konstantin Levin, aided by Bill Ritchie and Andrew DeRycke, and a surprisingly fine performance from Sara Mountjoy-Pepka. 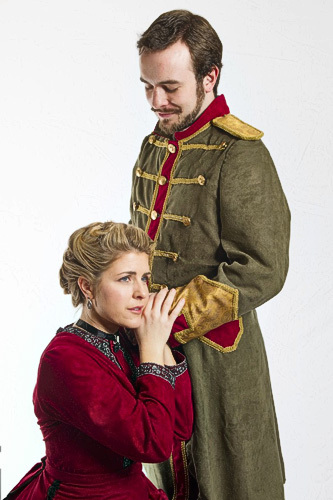 Scott Ward Abernethy shows the deft skill with language that I have come to expect from him and imbues the obnoxious Count Vronsky perhaps more sympathy than the character deserves. Tracy Hyland and Evan Whitfield are also quite good, and play their couple in a very measured, thoughtful counterpoint to the two main couples of the story. Emily Grogan’s Anna on the other hand often fails to convince me. I find her character often formless and not particularly attuned to several crucial moments where, subtly, the entire story changes. She struggles most of the evening for something on which to hang her character yet almost every choice she makes seems forced or desperate. Given that I admire this actress highly, I had to go in search of why this should be. Then I read the program notes. Kevin McKeon acknowledges the complexity of the novel in his adaptation notes. He is aware that a reader may come to various understandings about the characters and like or dislike them for whatever reason. This is possible because they are fully sketched human beings with contradictions in their blood. But he is also aware that his adaptation of the novel is about a changing Russia and its changing values: Anna Karenina is but a small part of it, and in many ways Kostya Levin is the real protagonist of the tale. By comparison, director Mary Machala’s notes talk about feminism, love, personal identification with tragic heroines (though how she lumps Moll Flanders in with Emma Bovary and Tess d’Urberville is completely beyond me) and does not address anything beyond character, character, character. But directors are not responsible for making me feel anything about characters: the actors are. Directors are responsible for choosing an interpretation about what the play means and removing obstacles so that the actors can do their work. Particularly in text-based classic theater, the director must make a convincing argument what this play means and, to some degree, why it is being done at all. Everything else is tertiary at best. Character and audience opinions about characters are not of the essence. A play in which everyone sympathizes with a character yet still means nothing is a failure. An eight hundred page novel does not reduce to a simple love story any more than the Cuban revolution reduces to the fact that Castro had a lousy fastball. To try to force such a play to be “about” love or “about” women’s roles is to miss the entire point of the novel. Having read more than enough of Tolstoy and his infection theory of literature, I am quite certain he could have hardly cared less about women and their social roles. He was a brute and a sexist pig the likes of which American literature could hardly even conceive. Read The Kreutzer Sonata and you will see exactly what I mean. He does not care whether a reader sympathizes with Anna or not; he gives the reader a cautionary tale about morals and lets the chips fall where they may. Anna Karenina is really a male role in women’s clothing. It is the role of Russian literature’s “superfluous man,” as old as Lermontov’s Hero of Our Time or Pushkin’s Yevgeny Onegin. “Superfluous men” are, to quote Encyclopedia Brittanica, “is usually an aristocrat, intelligent, well-educated, and informed by idealism and goodwill but incapable, for reasons as complex as Hamlet’s, of engaging in effective action.” Levin’s brother is an example, and Levin himself to a degree shows the same trait. Tolstoy even repeats the phrase through Levin’s speech. The real breakthrough of Anna Karenina as literature is that it is the first time a renown Russian author applied the character type to a woman. It is Tolstoy’s response to Madame Bovary, which he had bound in translation together with Shakespeare’s Othello while he wrote Anna Karenina. Women and men in Tolstoy’s Russia are both superfluous. That is his point. Women trying to achieve the stations of men are doomed to fail when the men themselves cannot even figure out how to accomplish anything. This is the “meaning” of the novel. It is very much about a Russia on the cusp on modernity and suffering severe growing pains as a culture. That meaning is not sufficiently on display in Ms. Machala’s direction. She understands, I think, that the three dyads–Dolly/Stiva, Kostya/Kitty, Anna/Vronsky–are interrelated. What she does not convey is any particular opinion about one or the other. Anna Karenina is, in many ways, on the exact same journey as Kostya. There needs to be in the production some sense that her actions are not merely individual but rather a metaphor for a breakdown in social values at large. She is not a woman; she is a class personified. There is, certainly, a point at which one has to stop pursuing a definitive meaning, or turn the entire play into a collegiate thesis, reductive and rather stupid. But the director must know where that point is. The director has to make up her mind about what meaning to enforce clearly, what argument to make for the play, and then how far to take the argument. I do not think Ms. Machala pursues any meaning nearly far enough; as a result, too much is ambiguous and unconvincing of anything. I believe Mr. McKeon’s adaptation makes an argument of some sort about social values though perhaps not the strongest one possible from the book. But he clearly understands the parallel structure of events. For instance, Kostya and Anna both have their opportunity to forgive and accept forgiveness. Anna does not; Kostya does. He goes on to a happy life that Tolstoy would argue is the meaningful role of marriage in society, and Anna of course throws herself under a train. Yet watching the Book-It production, I felt no sense the two had much to do with each other throughout the evening. The meeting between Levin and Anna Karenina at the denouement is an exception, and clearly something is passing between them but by then the argument of the play has so long ago been lost that it seems a completely isolated moment. The production could make a good argument for Tolstoy’s vision of Russia. It could also argue against it. It could also use Tolstoy’s book to give modern viewers a series of tools to think about the current breakdown in contemporary morality in their own United States. It does none of these. Instead it provides the actors with ample room to explore their characters and to show off their talents, which are considerable, and for the audience to admire Jocelyne Fowler’s beautifully subtle costume design and a bit of “jolly good theater.” For some doubtless that is enough, but I am not one of them. I prefer a play to appeal to something more than nostalgia, particularly when two authors–Mr. McKeon and Count Tolstoy–clearly put in the labor to make it far more.